Mobile indexing launched recently, based on a decision taken in March 2017 when Google decided that they were going to provide a better experience for mobile/cell phone users. The result of this decision is that websites which are mobile-friendly will now to be indexed with a higher priority by Google during search results. 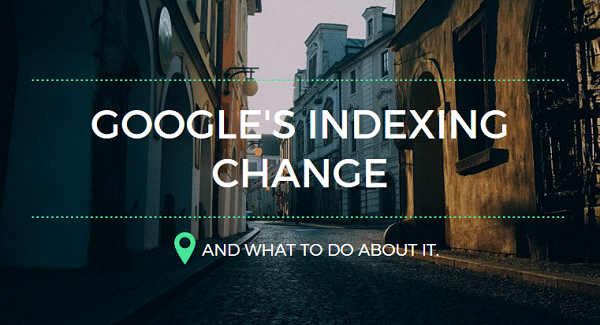 From now on, Google, desktop-friendly versions of your site will no longer be first in their indexing process. This switch is made because more and more searches come from a mobile device so it was time to prioritise mobile results. It is important to note that the mobile-first index is not a separate index, Google has only one index from which it serves the results. Google will determine by the content available on your mobile site how you will rank — both on the desktop as well as on mobile. At first glance, mobile indexing sounds scary, but for most WordPress sites there will be a minimal consequence, as most of the websites on this platform have a responsive design. When designing ‘responsively’ both mobile and desktop display the same content. You’ll have nothing to worry about in this case. However (and here is the big ‘but’), if you have different websites for mobile and desktop and your mobile website has far less content – you need to review the impact mobile indexing has on our site! It’s going to be hard to rank if your site is not mobile friendly. So there’s work to be done if this is the case. Check out Google’s mobile friendliness test and check whether or not your site is mobile friendly. In our experience, this is a minimum requirement. If your site does not pass this test, your mobile version is bad. Reading from a screen can be hard. And reading from a mobile screen is even harder than reading from a big screen. To attract a mobile audience, you’ll need to have mobile-friendly copy. This means short sentences and compact paragraphs. You need to make sure your font on your mobile site is large and clear enough, and you need to make sure to use enough white space. What are you doing to ensure you are using marketing information with integrity? We all have access to other people's information - just have a look at your cellphone and email contacts, as well as any newsletter databases if you think you don't! Are you being responsible with that information, particularly when this info is held by companies? How you use it and how you protect it, is paramount. Worldwide, the regulations regarding governance and compliance are getting more strict. If you need to audit your processes, your database integrity or anything else regarding the legal use of data, take time right now to put in a call to Kingsway Marketing. Thanks to YoastSEO for reference information. If you ‘fail’ the mobile-friendly test, or don’t perform well enough, call us for a consultation. When you start ‘getting found’ on Google, you’ll be glad you did! If you want to be kept up-to-date on our news items, complete your details and we’ll let you know when we’ve added some news to our Blog. We’ll never share your info with anyone, ever!